I had a bit of a baking disaster yesterday, I was trying to make a roulade, and well it completely collapsed! I vaguely remember making a swiss roll at school (not quite the same I know) so thought if I could do it then, then surely 18 years later I can do it now! It appears not! The filling was also a bit ick, I followed the ingredients for the filling but something was not quite right, I’m kinda thinking there may have been some typos, it was a bit of a cream cheese overload! We had a taste of the collapsed roulade after all it is the taste not the appearance that counts but to be honest it wasn’t very nice, the filling was weird tasting. So sadly although I hate to see food wasted it ended up in the bin. I was surprisingly OK about having a baking disaster, I was able to laugh about it, I guess as I was making it for pleasure rather than for an occassion or for someone special it took the pressure off, otherwise it may have been a lot of panic. Even though I had a bit of a confidence knock yesterday I woke up feeling up for an experiment. Something I never do. I normally look through my cook books pick a recipe and follow it to the very last gram and letter. 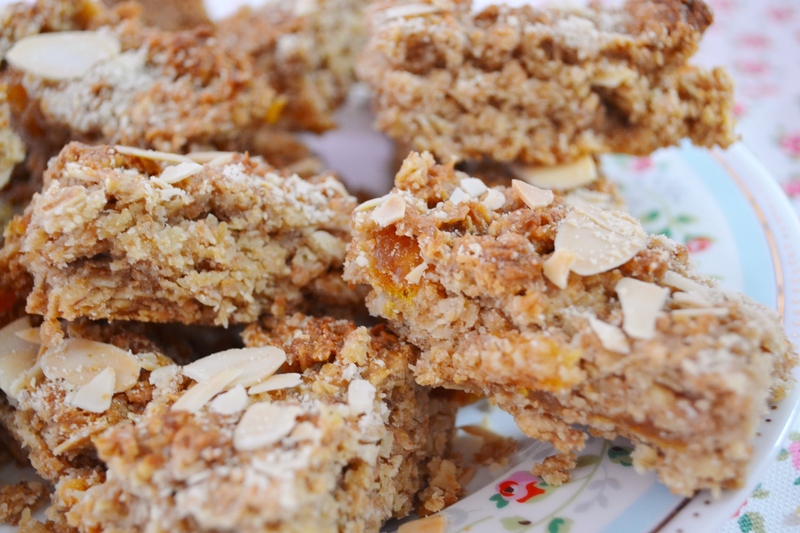 The ingredient that inspired me was some dried apricots I had left over, I had some oats so decided to make flapjacks. I knew I would have to make some adaptions when I realised I didn’t have any golden syrup or brown sugar. 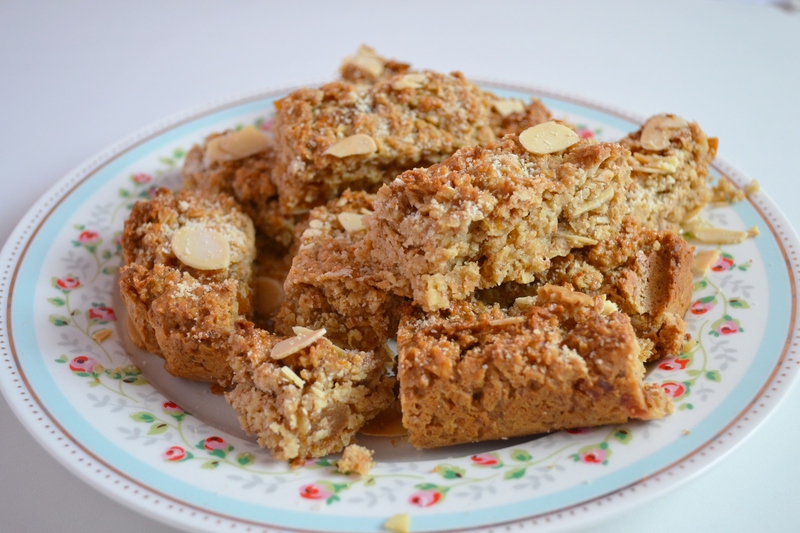 I love almonds and thought it would be a great addition to the recipe, I used both ground and flaked almonds. Instead of golden syrup I used honey, and instead of brown sugar I used regular granulated sugar. 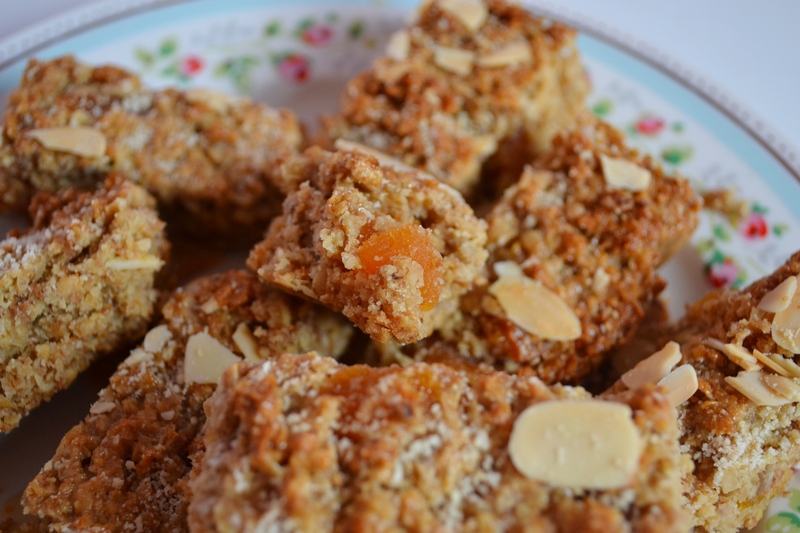 I melted the butter, honey and sugar in a saucepan, and then added the oats, dried apricots, ground and flaked almonds. 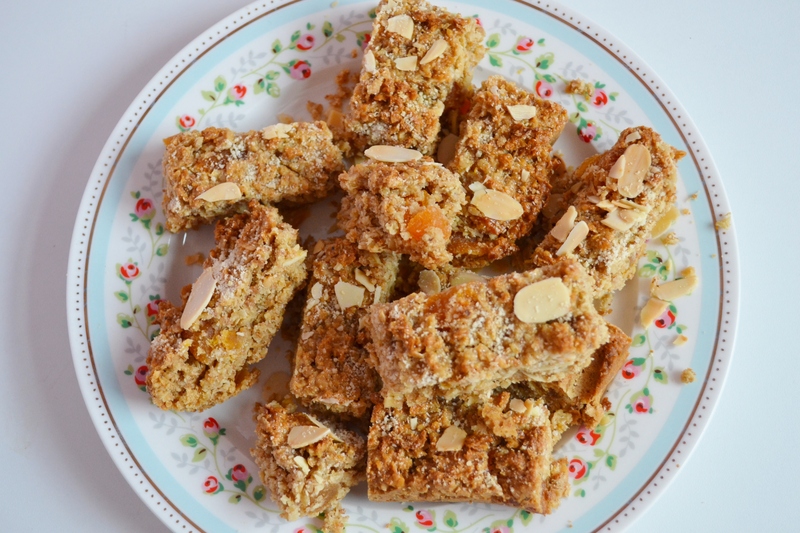 Once it was all mixed in I pressed into a 20cm square cake tin sprinkled some flaked and (a little) ground almonds on the top and baked it on 180’c for about 25 minutes.